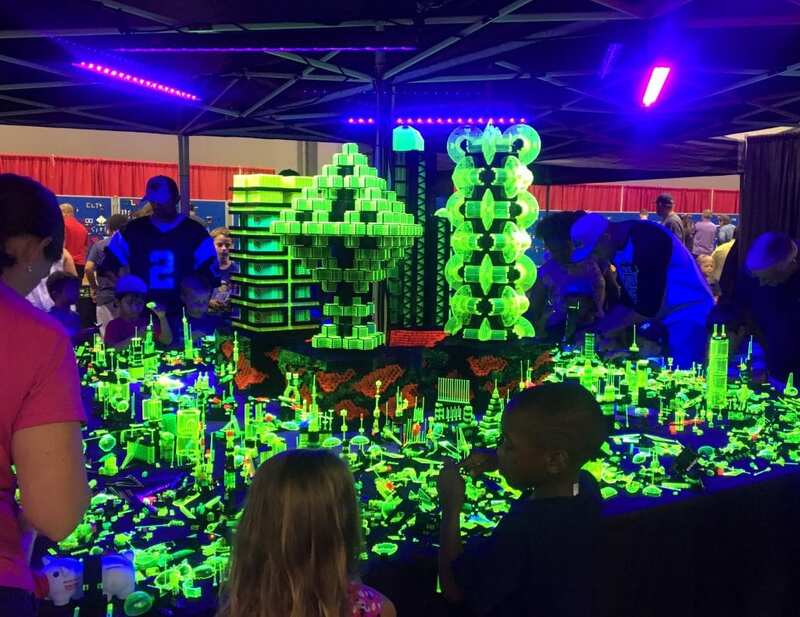 Brick Fest Live! Review by Carrie Smith | BrickFest Live! 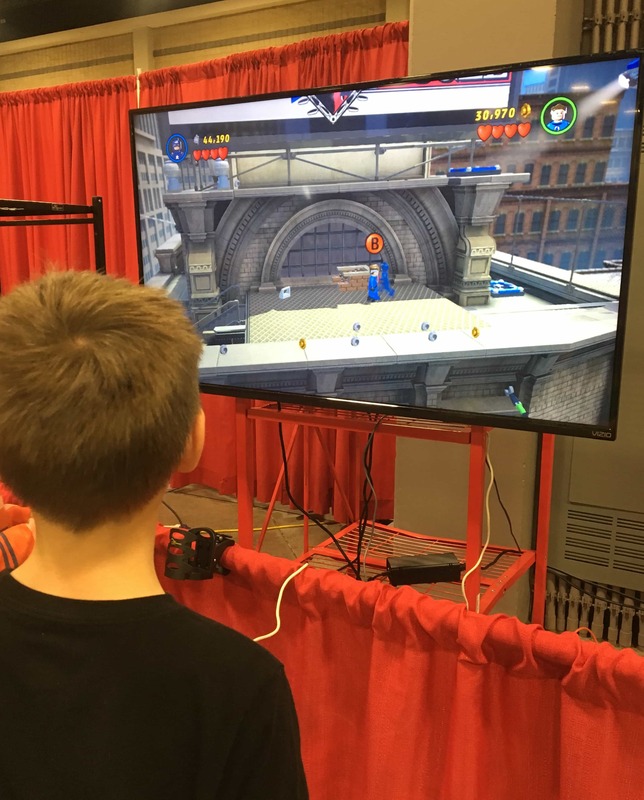 Lego Fun Is Coming To A City Near You! BrickFest Live! 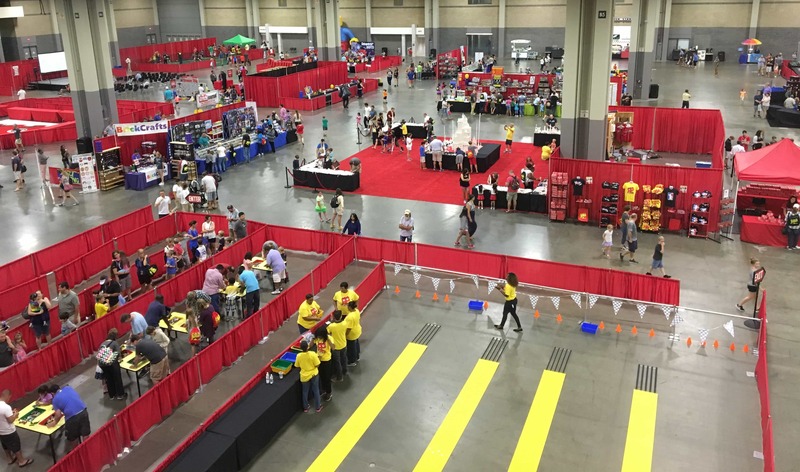 Lego Fun Is Coming To A City Near You! This is a sponsored post in conjunction with USFamilyGuide. All opinions are my own. This post contains affiliate links at no additional cost to you. 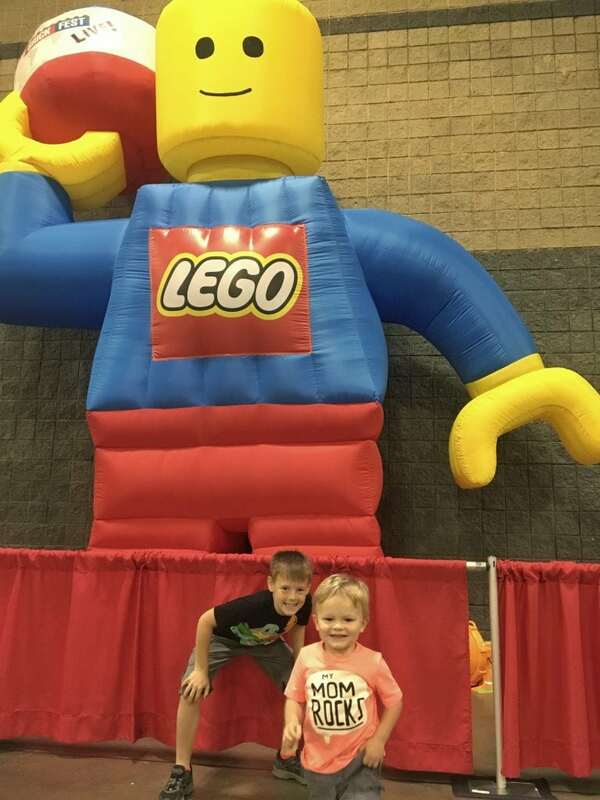 This weekend my family and I had the privilege of attending BrickFest Live! In Charlotte NC. 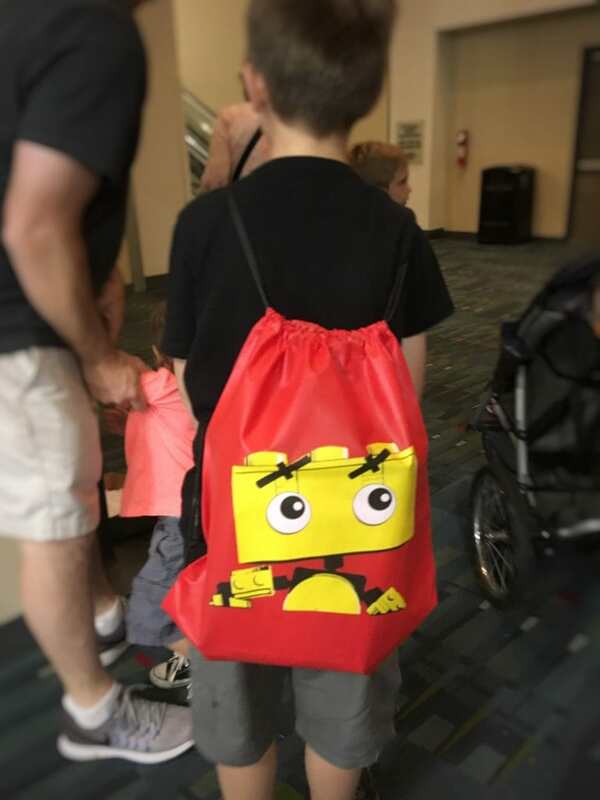 I have a family of boys that love to play with and build things with Lego’s so I was super excited we got to go! 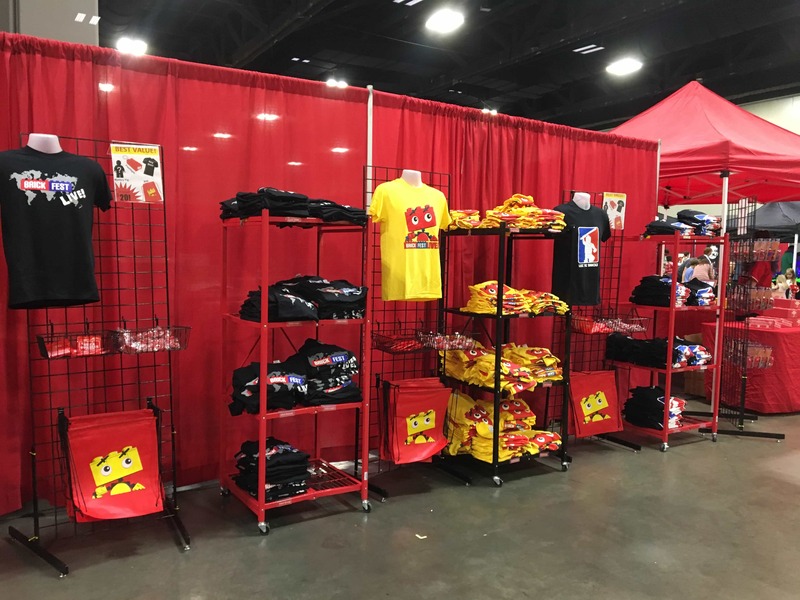 Super excited, we got up early and made our drive to the Charlotte Convention Center. 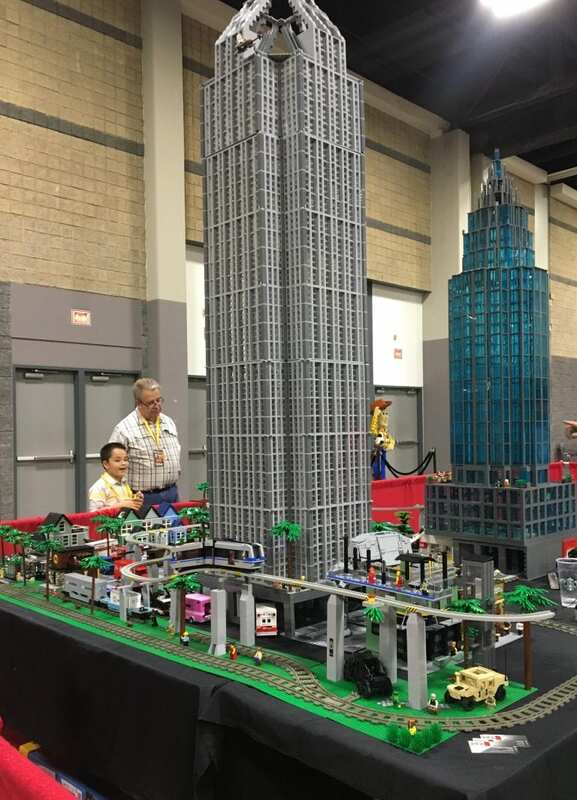 We hurried through the doors and down the escalator to a room that was so filled with Lego’s that we didn’t know where to start!! 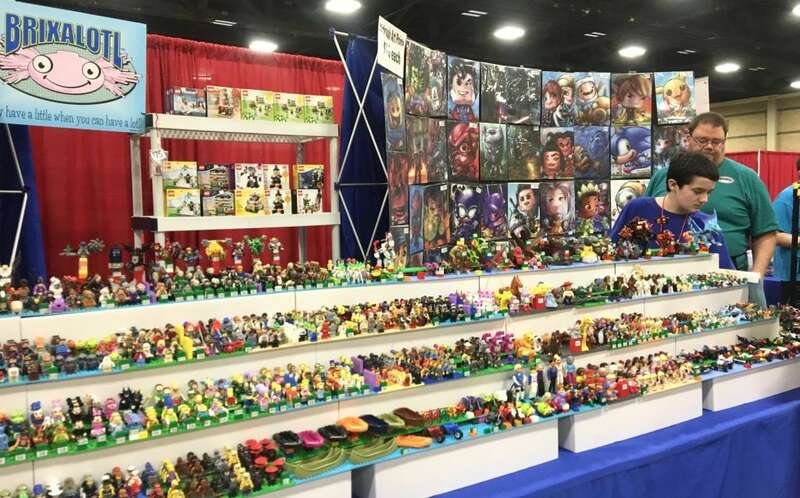 There were Lego’s of all shapes, sizes, and colors EVERYWHERE! 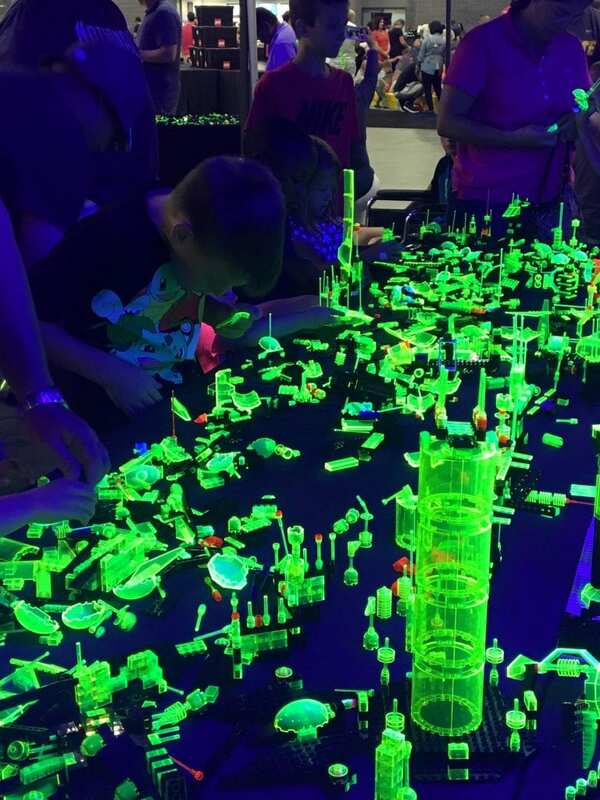 So, we just jumped right into the fun at the first section we saw as we walked in -the Glow Zone, with tables full of glow in the dark Lego’s and black lights making masterpieces shine! 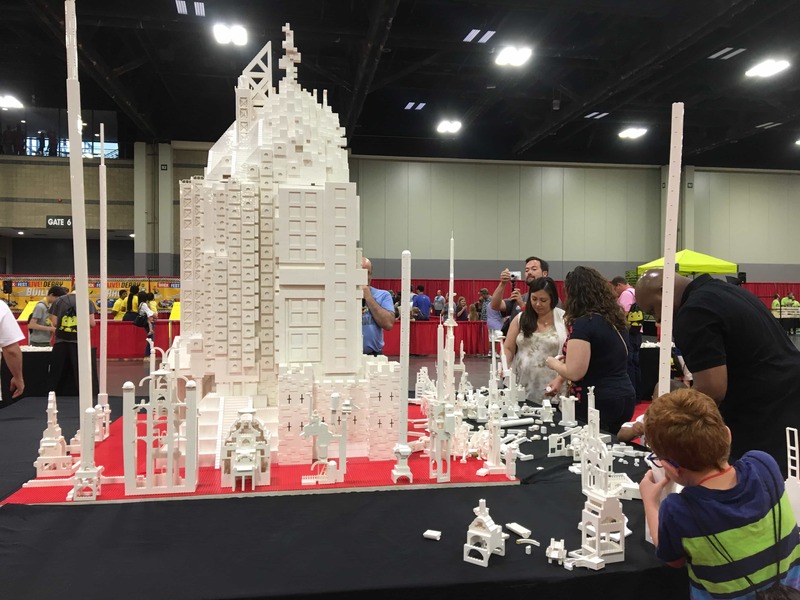 In addition to the glowing Lego’s, there was an all white Lego’s section with more tables piled high of white Lego pieces in all shapes and sizes! 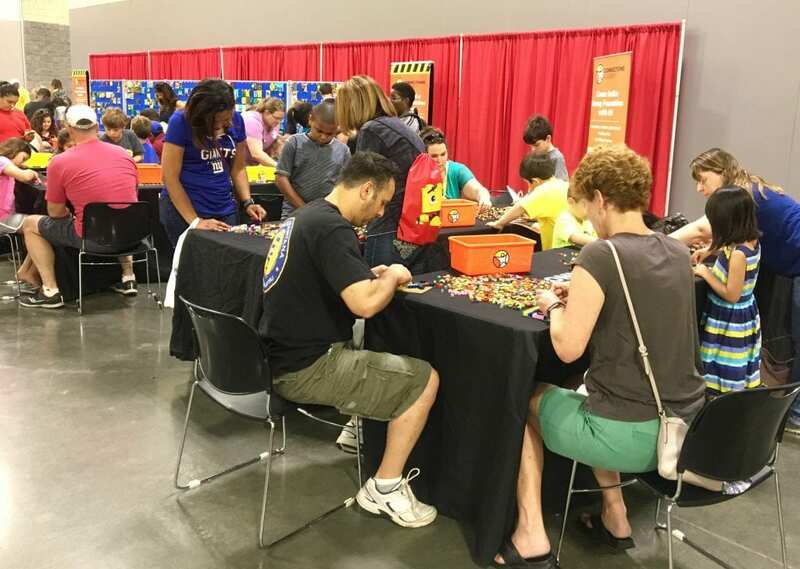 Even more tables were lined up full of colorful Lego’s to sit and create whatever you can imagine! 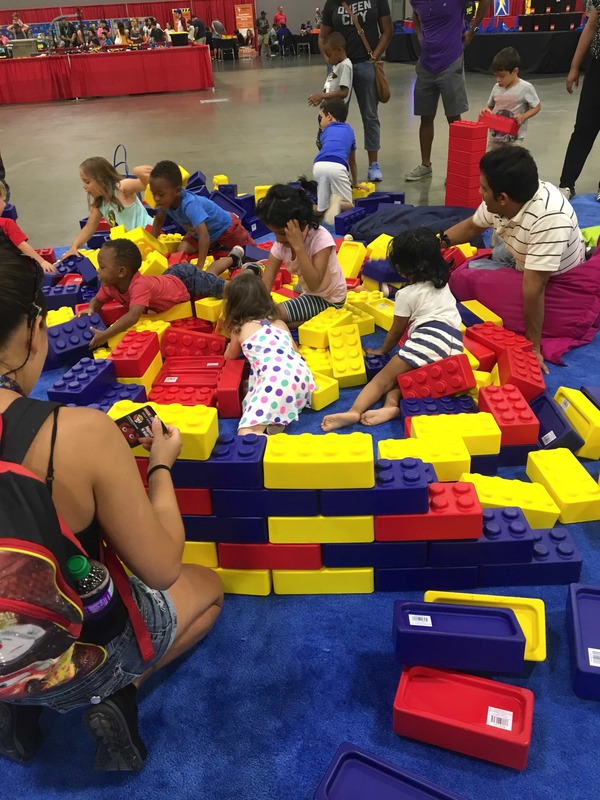 I personally loved the Lego Build Walls that were lined up where you could sit or stand and create a masterpiece on the walls! My youngest had a good time with them too! 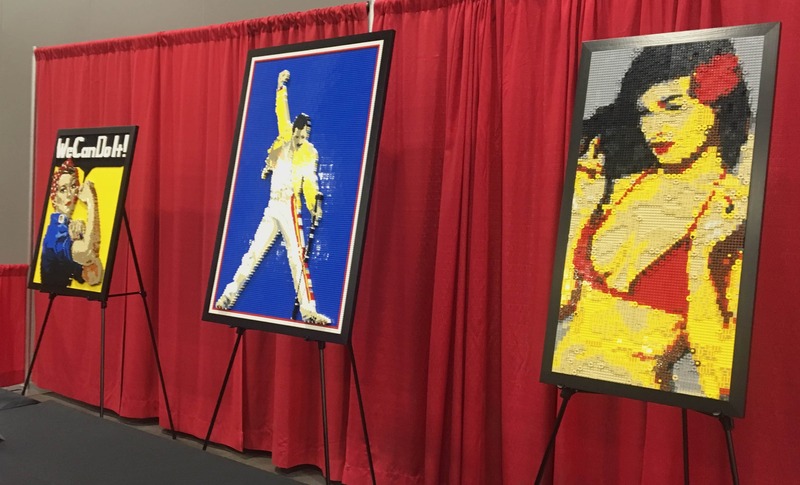 To prove just how amazing Lego’s can be, breathtaking Lego mosaics and artwork were on display. 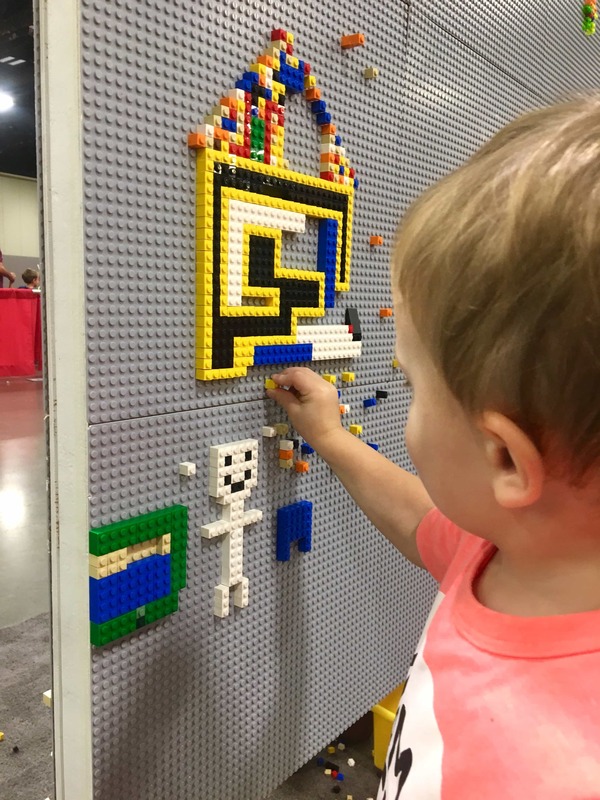 The number of hours and Lego’s spent using these tiny little blocks to re-create beautiful art was unbelievable. My youngest son loved the Brick Pit ‘pool’ full of blue Lego’s. 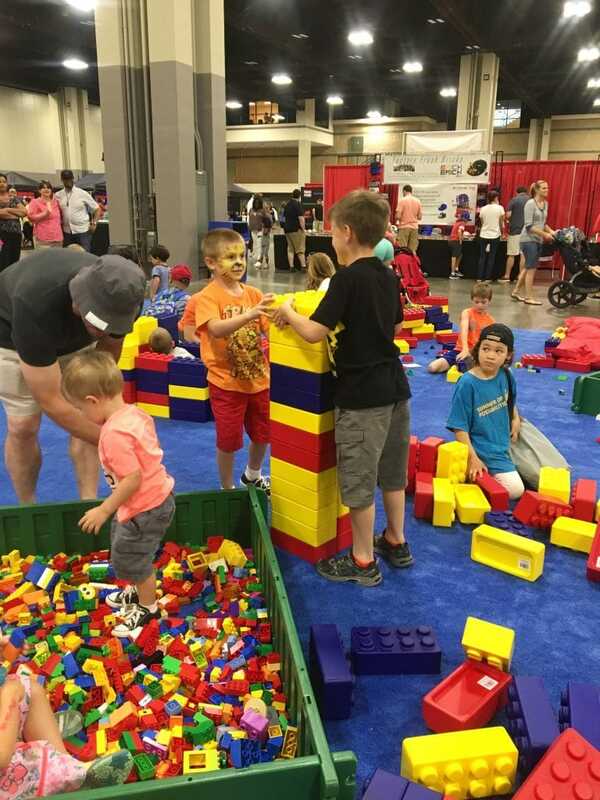 Kids jumped in swimming and stacking Lego’s for us parents to admire. 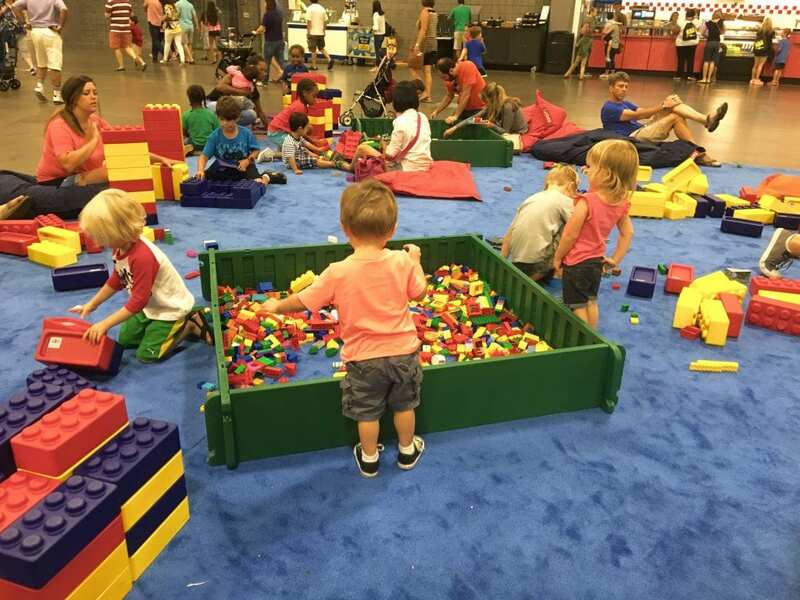 There are so many bright and fun Lego colors to combine, that it was fun seeing stations packed full of the individual colors! 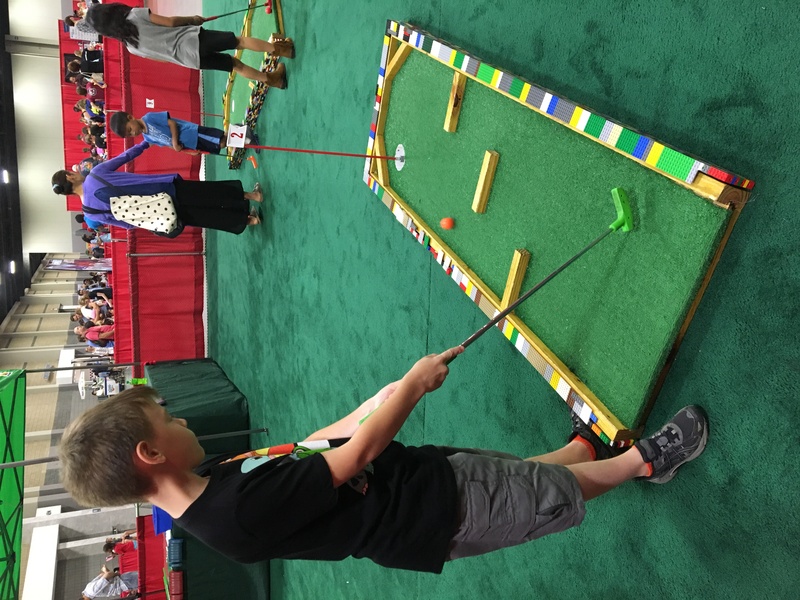 Miniature Lego golf was a must do and it was fun! 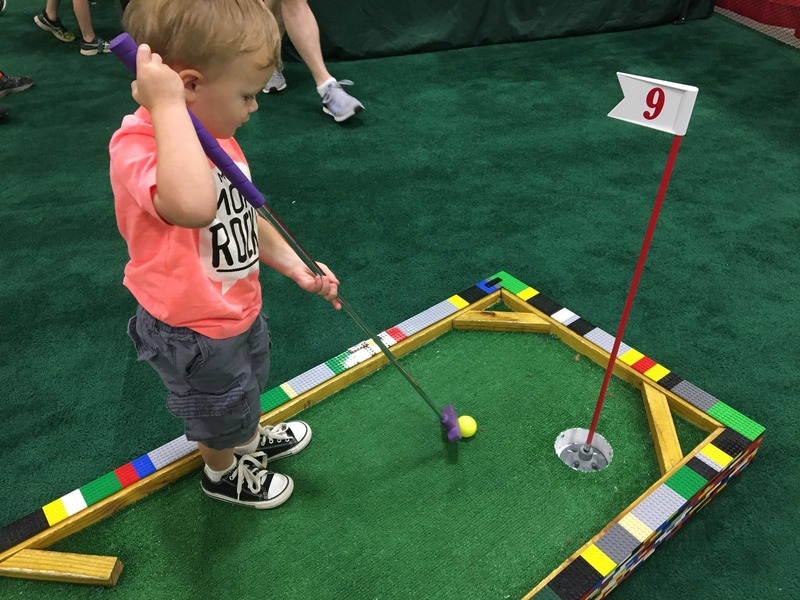 We quickly played 9 holes of Lego inspired greens. 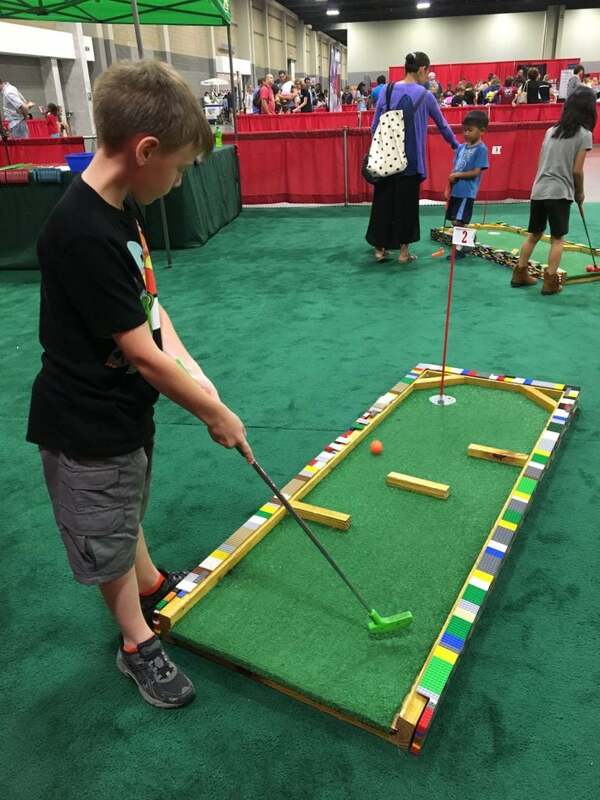 The line wasn’t too long which was nice, and my youngest got to try out his swing for the first time! For the gaming lovers, TVs were set up at the Brick Fest Gaming area with Lego video games for everyone to give a try. All the kids did a great job allowing others to have a fair turn, and we didn’t wait long before having a chance to play. Lego Robotics were a big hit as evident by the longer lines. 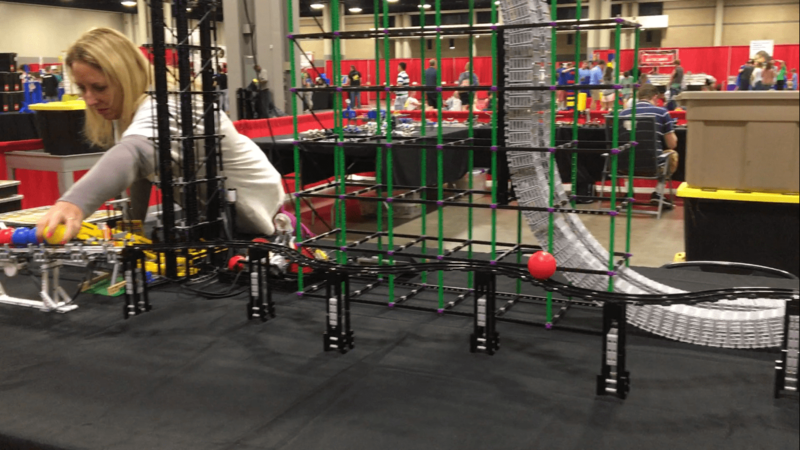 Meeper BOTS was a popular attraction where you could turn Lego’s into movable creations. We decided not to wait in this long line with a 2 year old; however I took note of these cool toys to tell Santa about! Brick Fest Derby also had a long line to wait in and I’m sure it was because of how cool the activity was! 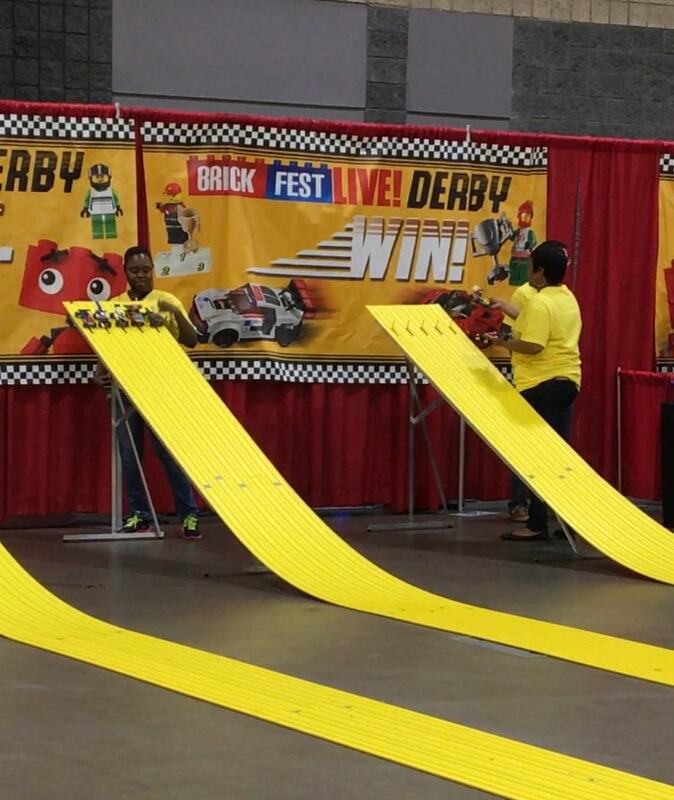 Kids of all sizes could build their own Lego Derby car and then race them down the 35 foot long tracks! 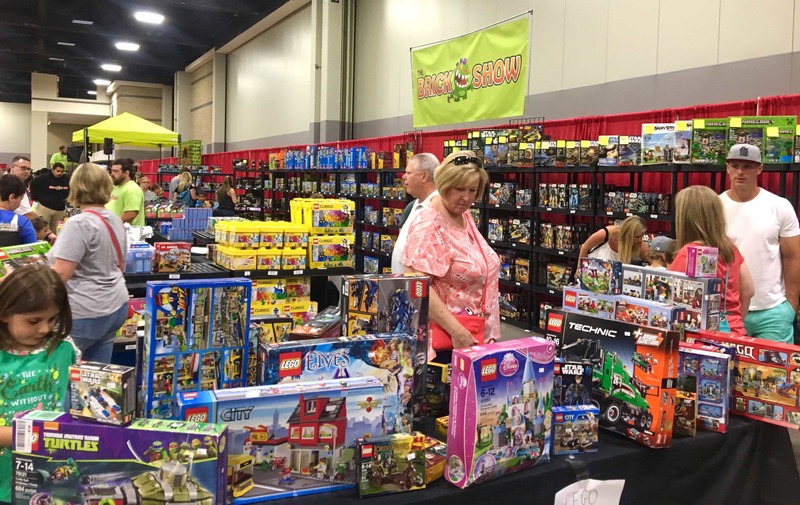 One of our whole family’s favorite parts was the Jr. Builder’s section on the floor hosting big pillows, sections of smaller Lego’s and super sized soft stackable Lego’s. 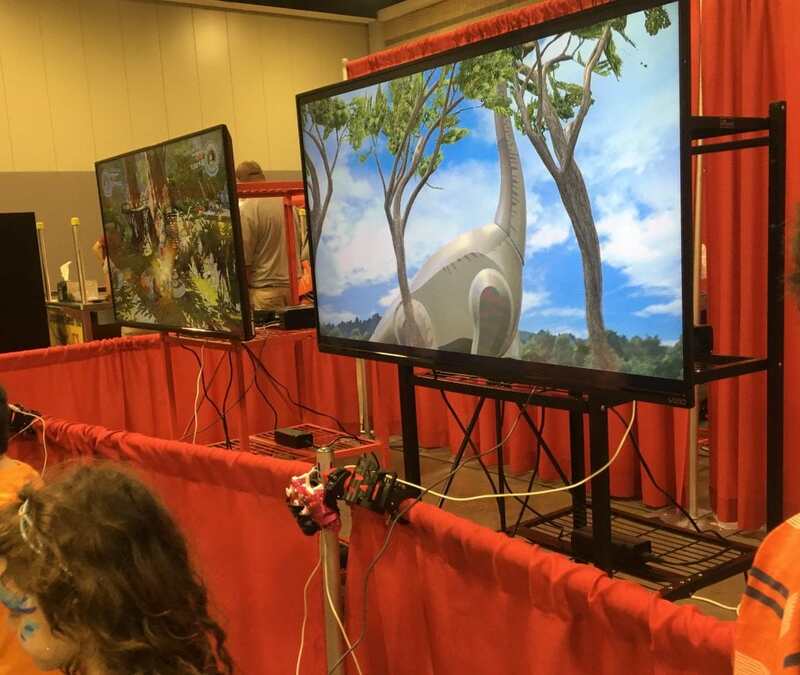 This section was fun for all ages and gave the parents a soft spot to relax as well! 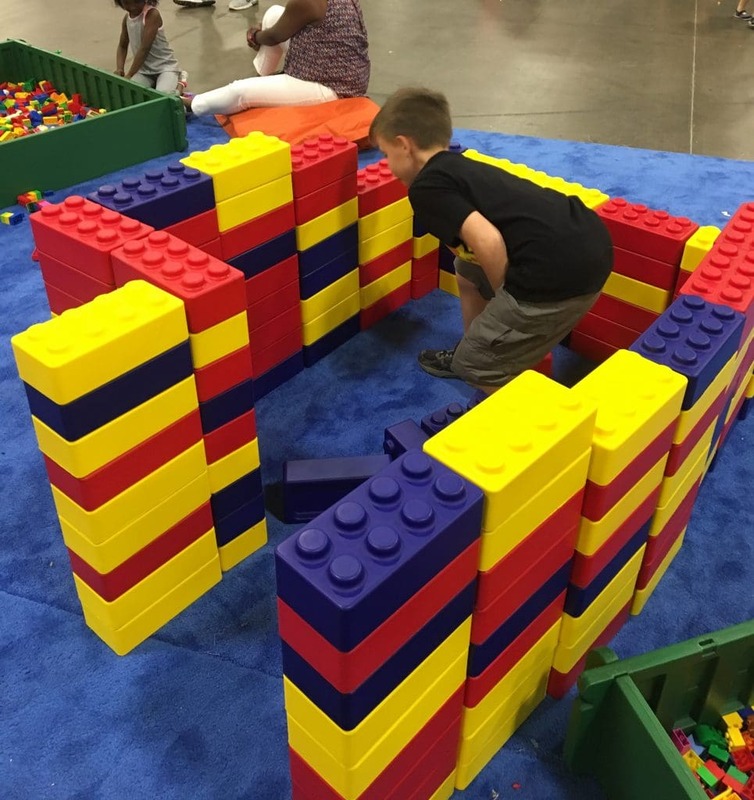 Kids were coming together to create forts including my oldest boy who raced along side a new friend to build walls as high as possible before they came crashing down! There were plenty of parents ready for a rest and plenty of chairs were available to relax and enjoy some Lego Trivia and entertainment. 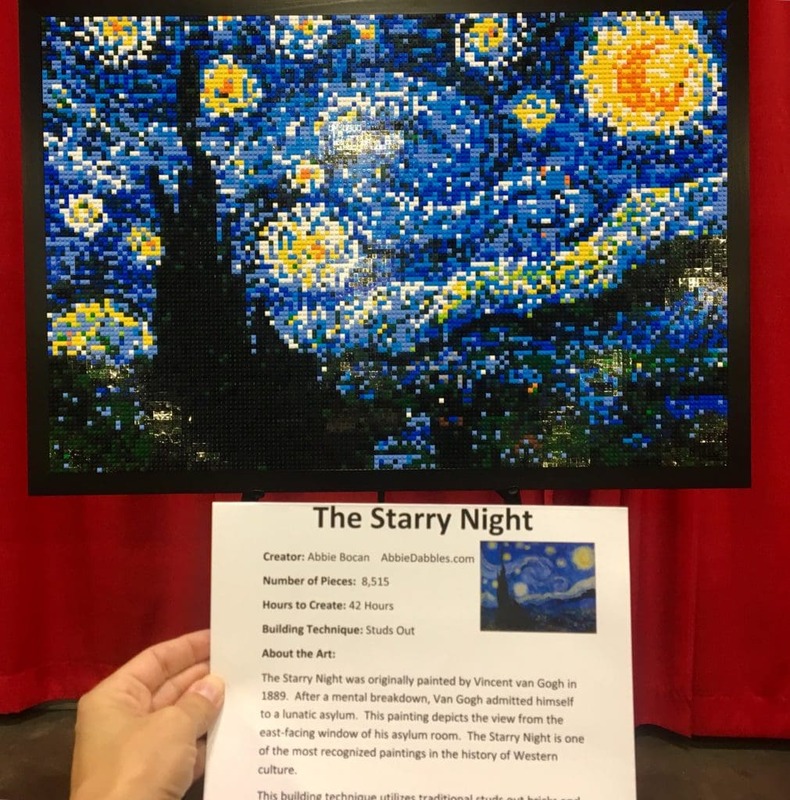 Displays were all around showing amazing Lego creations and motorized masterpieces! It’s truly amazing what Lego’s can do now! After being completely inspired, it was super easy to satisfy your urge and take home your next project! 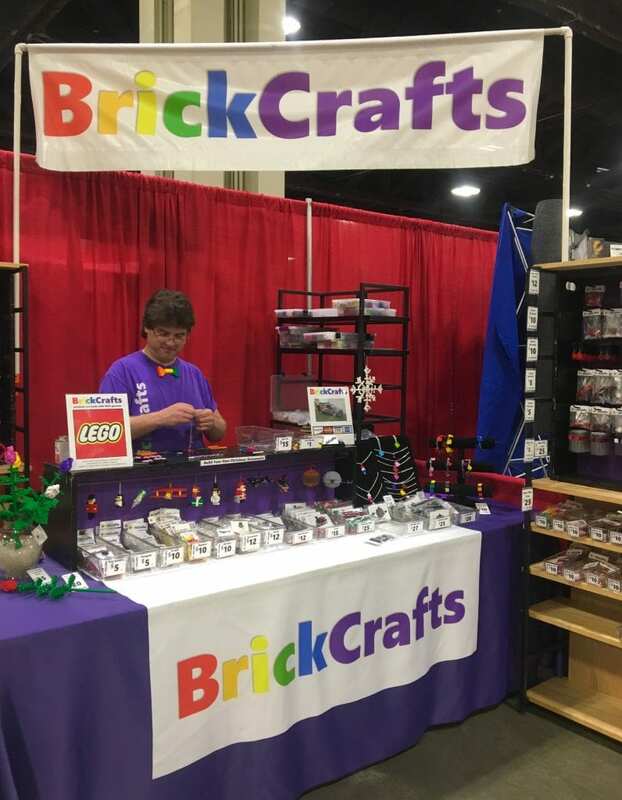 Lego shops were set up throughout to buy anything you wanted from kits to individual pieces. 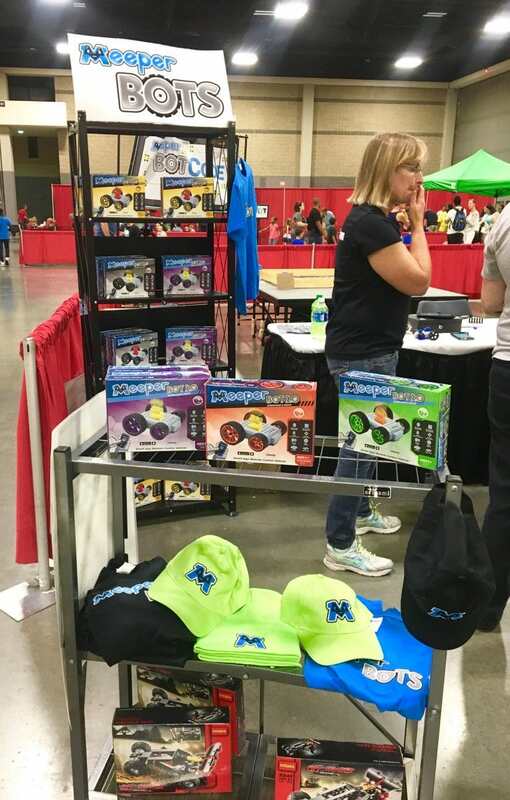 Rare, vintage, and custom merchandise were readily available everywhere you looked! 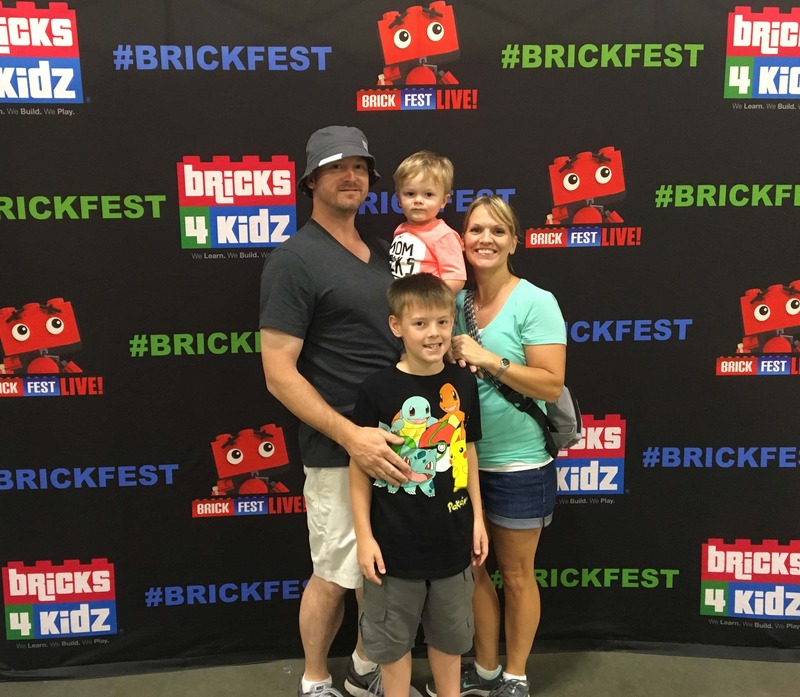 Of course, our sons wanted anything they could convince us to buy, but we convinced our oldest to go with the Brick Swag box which was a great deal! 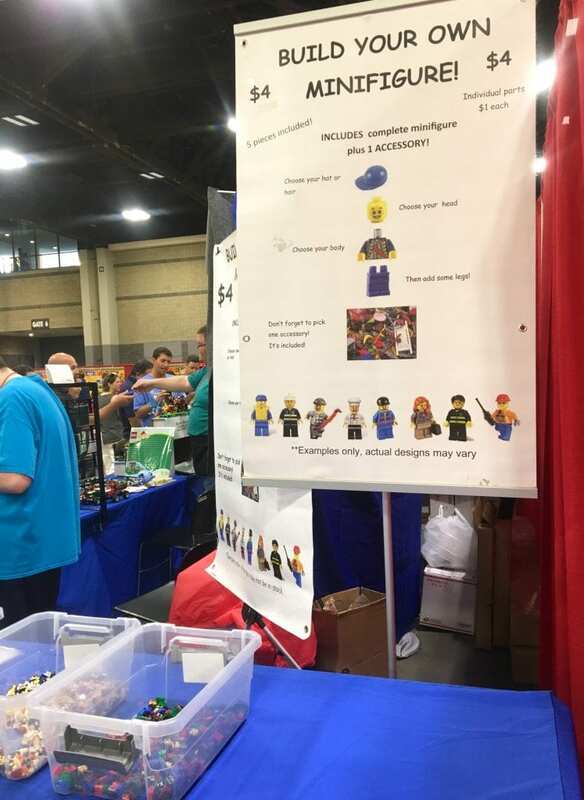 Only $20 allowed you to fill your box with a T-shirt of your choice, a mystery figure, a key chain flashlight, and a Lego bag! The boys had a blast playing with the Lego’s. 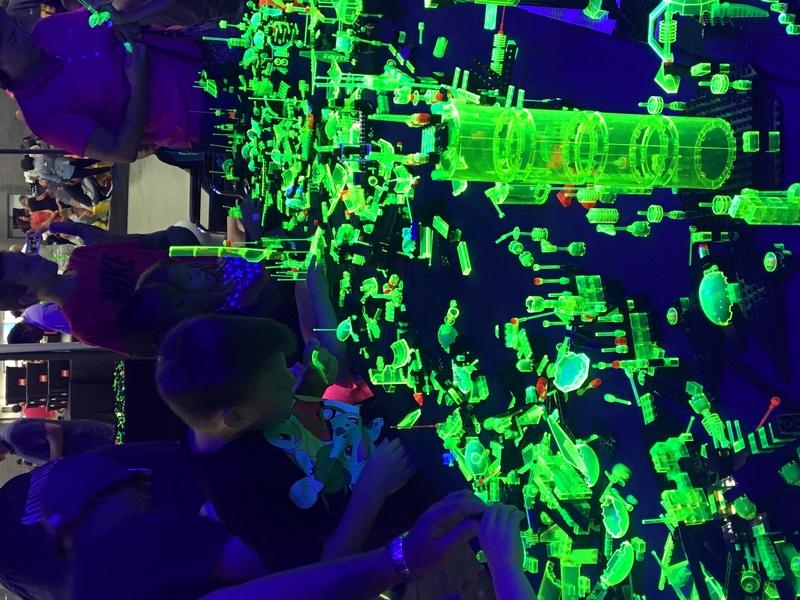 We returned to the Glow Zone and the Jr. Builder’s area several times. It was fun to watch the kids making friends and working together using their imaginations! I also enjoyed watching parents and adults taking a few quiet minutes to themselves to feel like a kid again and join in! 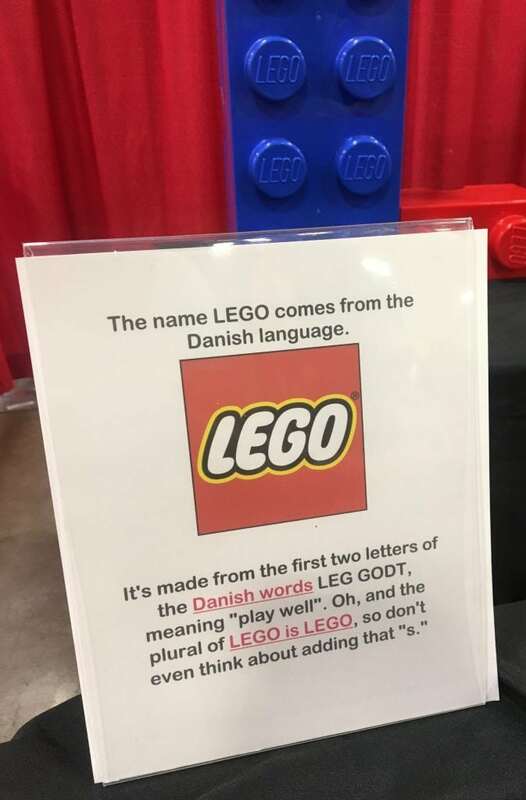 That’s the great thing about Lego’s, and always will be! Anyone at any age can enjoy them and will enjoy BrickFest Live! You can follow this link to see if there is BrickFest Live coming to a city near you! You won’t want to miss out on the fun!